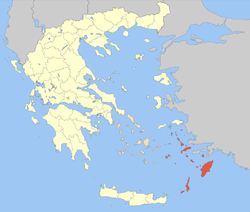 The Dodecanese (UK: /ˌdoʊdɪkəˈniːz/, US: /doʊˌdɛkəˈniːz/; Greek: Δωδεκάνησα, Dodekánisa [ðoðeˈkanisa], literally "twelve islands") are a group of 15 larger plus 150 smaller Greek islands in the southeastern Aegean Sea, off the coast of Asia Minor (Turkey), of which 26 are inhabited. Τhis island group generally defines the eastern limit of the Sea of Crete. They belong to the wider Southern Sporades island group. 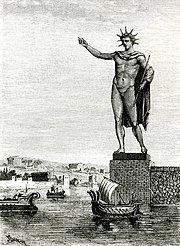 The name "Dodecanese" (older form ἡ Δωδεκάνησος, hē Dōdekanēsos; modern τα Δωδεκάνησα, ta Dōdekanēsa), meaning "The Twelve Islands", denotes today an island group in the southeastern Aegean Sea, comprising fifteen major islands (Agathonisi, Astypalaia, Chalki, Kalymnos, Karpathos, Kasos, Kastellorizo, Kos, Lipsi, Leros, Nisyros, Patmos, Rhodes, Symi, and Tilos) and 93 smaller islets. 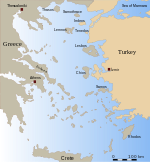 Since Antiquity, these islands formed part of the group known as the "Southern Sporades" (Νότιες Σποράδες). The name Dōdekanēsos first appears in Byzantine sources in the 8th century, as a naval command under a droungarios, encompassing the southern Aegean Sea, which eventually evolved into the Theme of Samos. However it was not applied to the current island group, but to the twelve Cyclades islands clustered around Delos. The name may indeed be of far earlier date, and modern historians suggest that a list of 12 islands given by Strabo (Geographica Χ.485) was the origin of the term. The term remained in use throughout the medieval period and was still used for the Cyclades in both colloquial usage and scholarly Greek-language literature until the 18th century. The transfer of the name to the present-day Dodecanese has its roots in the Ottoman period. Following the Ottoman conquest in 1522, the two larger islands, Rhodes and Kos, came under direct Ottoman rule, while the others, of which the twelve main islands were usually named, enjoyed extensive privileges pertaining to taxation and self-government. Concerted attempts to abolish these privileges were made after 1869, as the Ottoman Empire attempted to modernize and centralize its administrative structure, and the last vestiges of the old privileges were finally abolished after the Young Turks took power in 1908. It was at that time that the press in the independent Kingdom of Greece began referring to the twelve privileged islands (Astypalaia, Chalki, Ikaria, Kalymnos, Karpathos, Kasos, Kastellorizo, Leros, Nisyros, Patmos, Symi, Tilos) in the context of their attempts to preserve their privileges, collectively as the "Dodecanese". Shortly after, in 1912, most of the Southern Sporades were captured by the Italians in the Italo-Turkish War, except for Ikaria, which joined Greece in 1912 during the First Balkan War, and Kastellorizo, which came under Italian rule only in 1921. The place of the latter two was taken by Kos and Rhodes, bringing the number of the major islands under Italian rule back to twelve. Thus, when the Greek press began agitating for the cession of the islands to Greece in 1913, the term used was still the "Dodecanese". The Italian occupation authorities helped to establish the term when they named the islands under their control "Rhodes and the Dodecanese" (Rodi e Dodecaneso), adding Leipsoi to the list of the major islands to make up for considering Rhodes separately. By 1920, the name had become firmly established for the entire island group, a fact acknowledged by the Italian government when it appointed the islands' first civilian governor, Count Carlo Senni [it], as "Viceroy of the Dodecanese". As the name was associated with Greek irredentism, from 1924 Mussolini's Fascist regime tried to abolish its use by referring to them as the "Italian Islands of the Aegean", but this name never acquired any wider currency outside Italian administrative usage. The islands joined Greece in 1947 following as the "Governorate-General of the Dodecanese" (Γενική Διοίκησις Δωδεκανήσου), since 1955 the "Dodecanese Prefecture" (Νομός Δωδεκανήσου). In 164 BC, Rhodes signed a treaty with Rome, and the islands became aligned to greater or lesser extent with the Roman Republic while mostly maintaining their autonomy. 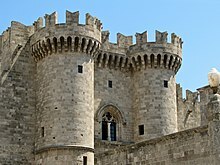 Rhodes quickly became a major schooling center for Roman noble families, and, as the islands (and particularly Rhodes) were important allies of Rome, they enjoyed numerous privileges and generally friendly relations. These were eventually lost in 42 BC, in the turmoil following the assassination of Julius Caesar in 44 BC, after which Cassius invaded and sacked the islands. Thereafter, they became part of the Roman Empire proper. Titus made Rhodes capital of the Provincia Insularum, and eventually the islands were joined with Crete as part of the 18th Province of the Roman Empire. In the 13th century, with the Fourth Crusade, Italians began invading portions of the Dodecanese, which had remained under the nominal power of the Empire of Nicea; Venetians (Querini, Cornaro) and Genoese families (Vignoli) each held some islands for brief periods, while Orthodox monks ruled on Patmos and Leros. Finally, in the 14th century, the Byzantine era came to an end when the islands were taken by forces of the Knights Hospitaller (Knights of St John): Rhodes was conquered in 1309, and the rest of the islands fell gradually over the next few decades. The Knights made Rhodes their stronghold, transforming its capital into a grandiose medieval city dominated by an impressive fortress, and scattered fortresses and citadels through the rest of the islands as well. There is a Turkish Muslim minority living in the Dodecanese, especially in Rhodes and Kos, but also a few in Kalimnos. Sources have variously estimated the Turkish population of Kos and Rhodes to be 5,000, 6,000, or 7,000. Following the war, the islands became a British military protectorate, and were almost immediately allowed to run their own civil affairs, upon which the islands became informally united with Greece, though under separate sovereignty and military control. Despite objections from Turkey, which desired the islands as well, they were formally united with Greece by the 1947 Peace Treaty with Italy, ending 740 years of foreign rule over the islands. As a legacy of its former status as a jurisdiction separate from Greece, it is still considered a separate "entity" for amateur radio purposes, essentially maintaining its status as an independent country "on the air." Amateur Radio call signs in the Dodecanese begin with the prefix SV5 instead of SV for Greece. The 70th anniversary of the incorporation of the Dodecanese within Greece was marked in 2017, with the Greek Parliament holding a special celebratory session for the event. ^ Giannopoulos 2006, pp. 275–276. ^ Giannopoulos 2006, p. 275. ^ Ahrweiler 1966, pp. 79–81. ^ Strabo, Geographica, X, 485: "Now at first the Cyclades are said to have been only twelve in number, but later several others were added". ^ Giannopoulos 2006, pp. 276–278. ^ Giannopoulos 2006, pp. 278–280. ^ Giannopoulos 2006, pp. 280–284. ^ Giannopoulos 2006, pp. 284–294. ^ Giannopoulos 2006, p. 294. ^ "Yunanistan'daki Türk Varlığı". Archived from the original on 3 September 2014. Retrieved 6 September 2014. ^ The Dodecanese and the East Aegean ... p. 436. ISBN 978-1-85828-883-3. Retrieved 19 July 2009. ^ Hearfield, John. "German surrender of the Dodecanese islands". Retrieved 23 April 2014. ^ "European DXCC Entities". www.ng3k.com. Retrieved 18 December 2016. ^ HIS BEATITUDE THE PATRIARCH OF JERUSALEM AT THE CEREMONY OF THE 70TH INCORPORATION ANNIVERSARY OF THE DODECANESE WITHIN GREECE. JERUSALEM PATRIARCHATE - Official News Gate. 06/03/2017. Retrieved: 8 March, 2017. ^ Watch live special session celebrating Dodecanese incorporation to Greek state (video). Protothemanews.com. Mar, 01 2017. Retrieved: 8 March, 2017. Ahrweiler, Hélène (1966). Byzance et la mer. La marine de guerre, la politique et les institutions maritimes de Byzance aux VIIe- XVe siècless (in French). Paris: Presses universitaires de France. Doumanis, Nicholas (2005). "Italians as Good Colonizers: Speaking Subalterns and the Politics of Memory in the Dodecanese". In Ben-Ghiat, Ruth; Fuller, Mia (eds.). Italian Colonialism. New York: Palgrave Macmillan. ISBN 0-312-23649-2. This page was last edited on 15 January 2019, at 23:15 (UTC).